Will the boat sink or break down? Rainbow Runner on the way back to her moorings in Mangrove Bay after a day of creating memorable experiences. 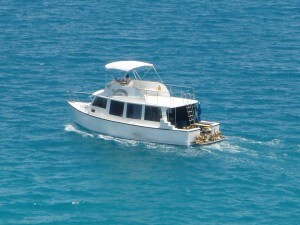 Dive vessel, Rainbow Runner is sea worthy, having made an ocean crossing from Miami to Bermuda. She is constructed from solid laminated fiberglass, not foam core. She has water tight-bulkheads that go above the waterline. The one inch thick plexi-glass bottoms are surrounded by water proof compartments. The keel has a steel shoe on the bottom protecting it from Bermuda’s treacherous reefs. The propeller has strong metal running underneath it for protection. (We have a spare prop). We have more buckets and pumps (electric and manual) than required by law. We have over 50 life jackets, yet we are licensed for 40 passengers. With 28 passengers (four dives of seven), we are never at full capacity. There are at least two cell phones on board, as well as a VHF radio. We are not required to have a life boat, because we dive within the reef line (less than 2 miles from shore). Though we do regular maintenance and have a fuel sight glass, we do carry tools, spare parts and extra fuel. To get a Bermuda Marine and Ports License all dive boats have an annual inspection of maintenance logs, oxygen unit, fire fighting equipment, flares, smoke signals training certificates, and first aid kit. A rope in the prop, or an impeller change would merely cause a delay.